6 8:31 Picked up the pace here. I think the urge to use the rest room pushed me a bit. 7 9:05 Bathroom break cost me about 30 seconds here. Every year without fail, I run the Legacy Midnight Half Marathon. It is sort of a summer tradition for me, having run it every year since I've moved here. In a way, it has become one of my favorite races. It is a fairly low key race and it is different: the race starts at 10 pm and generally you cross the finish line around midnight. 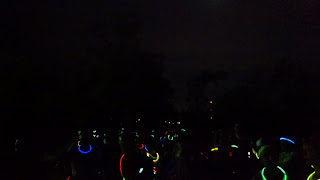 So it is a late night out, a supervised run on a darkened bike trail, and it is well attended with fun loving runners. Afterwards there is a bit of a party with music, food and just hanging around. 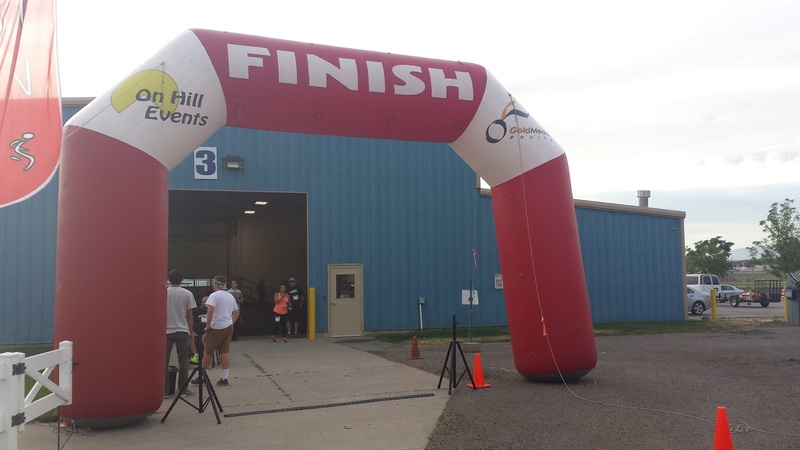 The race also has a 5K and 10K option, which both start at the finish line, so you will encounter them on your race. I arrived at the race site at about 8:00 and picked up my shirt and bib with little fanfare. I had about 30 minutes to kill before the buses left for the starting line. I wound up circling around taking pictures and seeing if I knew anyone. Around 8:30, I jumped on a bus and was one of the last to board the first bus, rewarding me with the very first seat in the bus. The bus ride was about a 15 minute affair to a "secret" location in North Salt Lake. 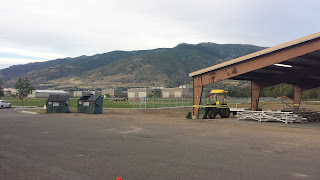 I was the first off the bus and the bus drive had mistakenly dropped us off at the 2012 starting location. The other 4 buses followed suite, which surprised me that they all left at the same time -- leaving no wiggle time for stragglers. Luckily, I knew where the race started and made the whopping quarter mile walk to the starting line. I am glad I was right because everyone else followed me and if I had been mistaken, I suspect I would've had a few hundred folks upset with me. I don't think anyone was even at the starting line (like race directors) but there was a station of Powerade and a starting line trellis. I made small talk with various runner friends before lining up at about 9:45. The race starts on a narrow bike trail. From past experience, I knew to line up near the front. With a course this narrow, I didn't want to get overly hemmed in. The race started on time and off we went. 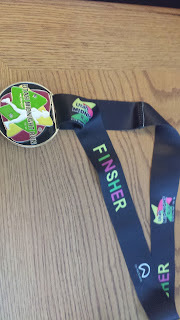 It was pretty warm and after my last half marathon experience I was sort of worried how I'd fare in the heat. I took a very conservative approach and led off with a comfortable 8:45-ish pace. My plan was that if I felt good at mile 6, to pick up the pace a bit and try to finish strong. After about a mile, another runner asked if she could run with me. I don't mind pacing but I am usually a solo runner. It was nice for a few miles to swap a few stories between gasps for breath. I wasn't running too hard, but I knew as the miles wore on, that I'd be less than a good conversationalist. Turns out the runner that I was running with had missed the bus and her and her mom had driven to the start line and needed a ride back. Since the ride back was on my way back I had no qualms about helping them out (which I ultimately did). Around mile 4-ish I started having some GI issues. I had had a high fiber soup for lunch and it wasn't working for me (but my dinner of a small pile of pancakes had gone done nicely). Around mile 6 I decided to make a pit stop so I pulled ahead of my running partner with an explanation that I had to use the bathroom and I'd try to catch up if need be. 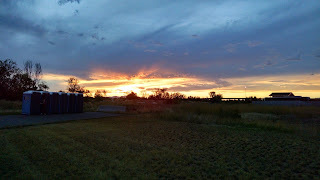 It wound up costing me about 30 seconds and just as I was exiting the porta-potty, I spotted Muriel, my running partner. Our reunion was fairly short-lived as I started to pick up the pace. I wasn't feeling awesome, but I felt good enough to try and make up some time. Muriel and I parted ways and I told her I'd catch her at the finish line if she didn't catch me sooner. I wound up tailing a few other runners for a few miles and around the 8 mile mark I wound up catching a lone-senior runner. While I hate to judge ages, this guy was clearly my senior -- by a bit --and he was moving pretty well. We wound up trading places with each other off and on for a few miles before I pulled ahead. We kind of made small talk but I could tell we were both focusing on getting through the tough miles. About mile 10, I started to run out of gas. I could tell I was getting dehydrated despite drinking at every aid station (which were situated at about 2.5 miles each) and carrying my own fluids. I did get some momentum by chasing and working off the 5K and 10K runners who were doing their section of the race. 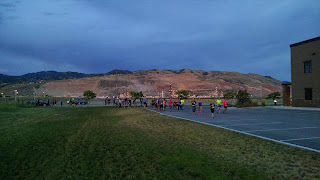 I didn't have any problems with running out of room on the trail and everyone was very considerate and I certainly enjoyed the motivation I got as people cheered me on. Around mile 12, the gray-haired runner caught me. I tried to catch up but I felt like I was laboring and running quick sand. Dead leg syndrome. I caught a bit of a second wind during the final mile. 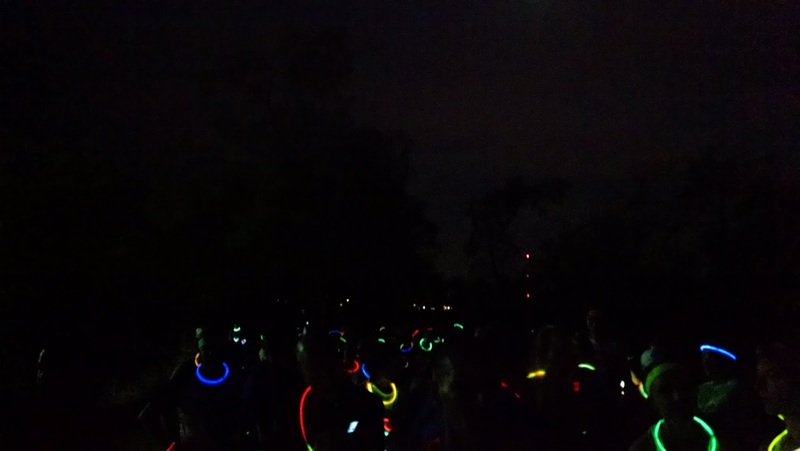 The last half mile is pretty dark and I was using my head lamp at this point to illuminate the way. The paved trail appears a bit rougher with more bumps and roots so I suspect I might've lost some time here. However, the majority of the trail is smooth and I only used my head lamp once throughout the race. In years past the course has measured short and it came out a bit short this year too. I've seen some satellite maps that put the course at 13.11, however. And I suspect my Garmin went into conniptions after using the restroom. I was pretty happy upon crossing the finish line. I just didn't want to have a meltdown like my 4th of July race and get clobbered by the heat. While I would've liked to have gotten a better time than last year (1:52), this year really seemed a bit tougher in regards to the heat. 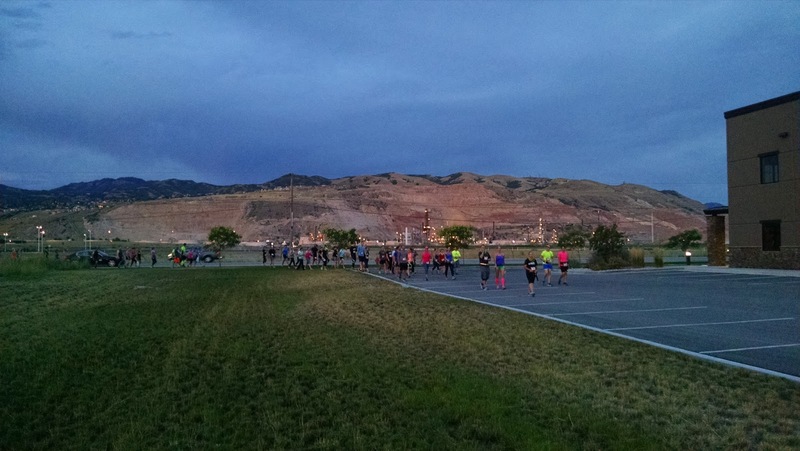 This race is a sister race to the Provo Midnight Half Marathon, so the shirt, medal and awards were identical. This time, however, I did notice that the lanyard for the medal has a misspelling on it (see photo above). After a quick perusal of the results I came in 2nd in my age group. The awards were taking a long time and it seemed like they were doing everything they could to not do the age group for men in the half marathon. I waited about 30 minutes and was happy to see Muriel (and her mother) get their awards, but I was getting cranky and I could tell they wanted to get back to their car (they had a super long drive). And, I had won my age group in the Provo race, so I knew I'd just have a duplicate medal. Overall, this race was a good experience. I got in for about $55 or so since I had a coupon. It was easy getting to the race and while it is hard to enjoy the scenery at night, it was peaceful to be running behind people's houses or along the highway with nothing but a headlamp and a glow stick. I've run on this trail a lot of times in various races so I know it pretty well but running at night seems so much better. Post race food consisted of bananas, ice cream sandwiches, powerade, water, and cotton candy. My stomach wasn't ready for food so I laid pretty low on it. I was dehydrated and easily went through 28 ounces of my own Powerade, plus whatever I could get down on the course and at least another 28 ounces after the race. I also made some new friends on this race and got to hang out with some established ones. Again, I really like the social vibe to this race and plan to do it next year.